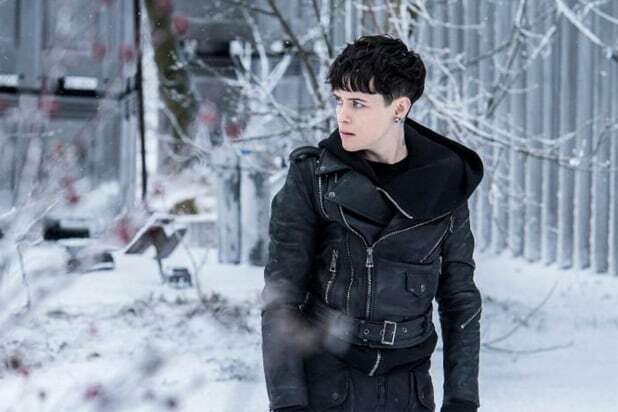 “The Girl in the Spider’s Web” heroine Lisbeth Salander isn’t just a near-superhero with a hidden identity and cool gadgets who helps others. She’s also the survivor of abuse, and because it comes out in the midst of the #MeToo movement, the film feels especially timely. But Claire Foy doesn’t see Salander as a face of #MeToo, which she says represents something far bigger. Foy, who won an Emmy for her portrayal of the queen in Netflix’s “The Crown” just on Monday, said she sees similarities between Salander and Queen Elizabeth in that they don’t show their feelings. Director Fede Alvarez introduced 20 minutes of “The Girl in the Spider’s Web” to journalists on the Sony lot. The footage opened with a scene explored in the trailer, of Salander invading a home to punish a man who had beaten his wife and two prostitutes. But the footage showed so much more — it revealed Salander’s private home, her love life (or lack thereof) and her means of employment, as well as awesome action scenes, fiery explosions and a stellar supporting cast of Sylvia Hoeks, Lakeith Stanfield, Stephen Merchant, Sverrir Gudnason and Vicky Krieps. Based on the book written by David Lagercrantz, “The Girl in the Spider’s Web” is the second English-language film based on the “Millennium” series of novels created by Stieg Larsson. Larsson died in 2004 before the publication of the original trilogy of novels, including “The Girl with the Dragon Tattoo” (2005), “The Girl Who Played with Fire” (2006), and “The Girl Who Kicked the Hornets’ Nest” (2007). Lagercrantz was authorized by Larsson’s estate to write new novels in the series in 2013. The film hits theaters Nov. 9.